LAFAYETTE, La. 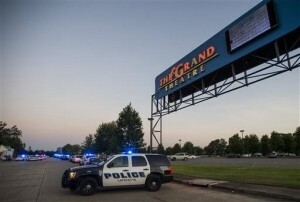 (AP) — A gunman opened fire at a movie theater in Lousiana on Thursday evening, killing two people and injuring at least seven others before shooting himself, officials said. The gunman, a 58-year-old “lone white male,” fired his weapon “numerous times” before shooting himself at the Grand Theatre in Lafayette, city Police Chief Jim Craft told a news conference. Craft said police know the gunman’s identity but are not releasing it. He said the shooter’s body was still inside the theater and that a coroner was on the scene. Earlier in the evening, Acadian Ambulance Vice President Clay Henry had told The Associated Press that the shooter was pronounced dead on arrival at a hospital. The shooting happened about 20 minutes into a 7 p.m. showing of the movie “Trainwreck,” The Louisiana Advertiser quoted theatergoer Katie Domingue as saying. “We heard a loud pop we thought was a firecracker,” Domingue told the newspaper. Domingue said she saw “an older white man” standing up and shooting down into the theater, but not in her direction. The jury decided unanimously Thursday that the Colorado attack was cruel enough to justify the death penalty. But jurors must first hear the defense’s arguments for a life term before deciding whether Holmes, 27, will be sentenced to death. The sentencing phase could last up to a month. Prosecutors said Holmes planned and carried out the massacre to assuage the pain of his failures in graduate school and in romance. Defense lawyers said schizophrenia had been growing inside Holmes’ mind for years and eventually overwhelmed him, creating a delusion that he could improve his self-worth by killing others and absorbing their value. I don’t think we want St. George News reporting news from locations that have nothing to do with Southern Utah or surrounding areas. Your reporters don’t add anything to national stories, and copying them here doesn’t help us in any way. We have national news sources for that. It just gets annoying to have to scroll through twice the number of articles to find the local ones. Let’s not make this a pattern. But wait – it’s a Dixie connection. I have to agree with SteveSgu. I come to St George News to look at local news (and look at all the ads, of course!). Leave all the national news to the insipid cable news networks. I very much agree. What drew me to SG News was the exclusive focus on local news. National events have no place here. We all get that elsewhere on the internet and don’t need a repeat here. It only makes it more difficult to find what we really want from this site. This is so sad. My heart and prayers go out to everyone involved and their families. Yeah wooooohoooooooo the shooter is. Dead Cool.!!!!! That will save the tax payers money…. Right On.!!!!! Nothing like good news eh. ?